Now Available - Brookland Utilities Pay Online! 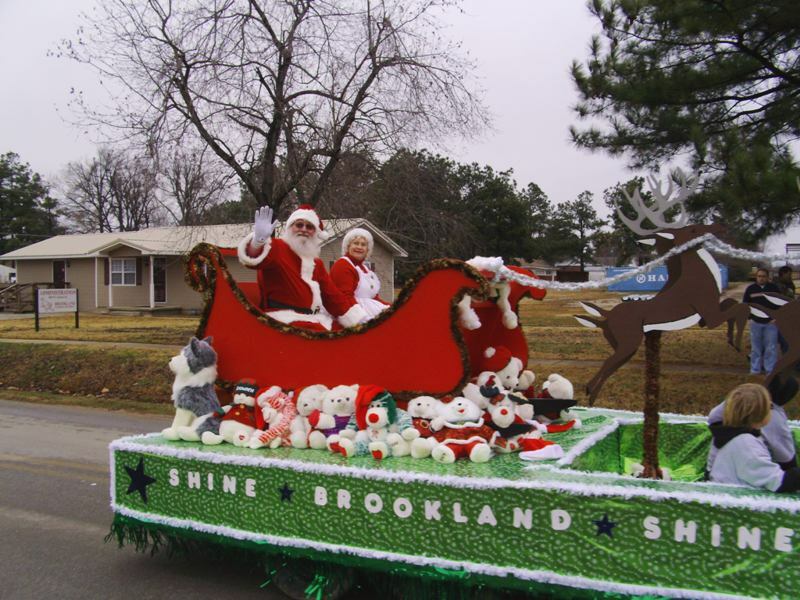 Brookland's annual Christmas Parade is held on the 2nd Sunday in December each year. It starts at 2:00 pm and the lineup begins at the Brookland High School Parking lot. Judging begins at 1:00pm and 1st, 2nd and 3rd place plaques are awarded in the following divisions: Float, antique tractors, antique/classic vehicles, horse & rider, horse/mule team and wagon and misc./other division. The parade route is approximately 2 miles long. It begins at the Brookland High School and travels down Holman (U.S. Hwy. 49-B) to Stevens Street. The route turns west on Stevens to Oak Street and then right on Oak Street to W. School Street and back to the school parking lot. There is no entry form or fee and everyone is encouraged to throw candy to children along the parade route for the hometown old-fashioned Christmas parade atmosphere. The first Brookland Christmas parade was held on December 9, 2001. The large turnout was overwhelming for the first event. Since that time, the parade lineup has improved and the parade draws alot of participation from the community. Brookland Baptist Church opens their doors for the community fellowship immediately following the parade. Church members provide refreshments for parade participants. Antique cars line up along Christy Street (beside Kum & Go). Antique tractors and horses gather behind the Agri building and beside the bus shop. Floats meet at the parking lot in front of the Auditorium and 4-wheelers and motorcycles congregate in parking area behind the auditorium. The 14th Annual Christmas parade was held December 14, 2014 and the theme was "Christmas Memories". Below is a list of the winners of the parade. 1st Place - Anthony Copeland, Jonesboro, AR - 1953 Farmall "Cub"
2nd Place - Carroll Dacus, Jonesboro, AR - 1946 Farmall "A"
2nd Place - Jack Robbins riding "George Strait"
3rd Place - Ethan Bales riding "Sammy Jo"
Judging begins at 1pm and there is no registration.